Some may think that collecting porcelain chamber pots is a pretty outlandish activity, but such receptacles are actually very popular with collectors and can also be extremely valuable. It has been recorded in 1575 that Queen Elizabeth I p*ssed in a silver chamber pot (such vocabulary was normal in those days), and in 1672 a gold ‘pisspot’ was pawned by a well-to-do lady, obviously fallen on hard times. 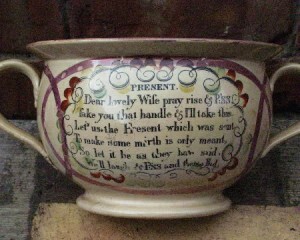 Pewter chamber pots were common until the 18th century when stone and porcelain became the vogue. No prizes for guessing which class of population used which! Collecting chamber pots, therefore, can offer a fascinating insight into the history and social mores and definitions of the day, whether you are collecting as a hobby or for investment. Until Thomas Crapper (okay… stop laughing, really) allegedly hauled our waste disposal practices into the late 19th century, the function was carried out by the rich in specially built cubicles round the walls of their castles, and by the common person out the window! Since this could be particularly inconvenient when one was awakened by a weak bladder or bowel at night (and also to passers by! ), chamber pots came to be essential items of sanitary furniture, generally stored under the bed for convenience. For the rich, it would the chambermaid’s duty to empty them, but for the poor – well, they slopped out themselves. Nevertheless, chamber pots took many forms, from simple earthenware bowls to beautifully fashioned porcelain creations that today are prized by collectors worldwide. As intimated above, the material of construction was determined by the wealth of the owner, and one wonders if they ever compared chamber pots when visiting. The intricacy and decoration of many of these would indicate that they were not simply hidden away, which is good for the chamber pot collector because it led to a large variety of designs and external and internal decoration. Many are hand painted, and just about every major and minor pottery, ceramic and porcelain factory produced their own version. From Minton to Wedgewood, and Delft to Dresden, the chamber pot was a major component of their range. That is part of the beauty of collecting porcelain chamber pots: it is one means of specializing and yet collecting from all of the major porcelain houses in the world. Other names given to the chamber pot included the aforementioned pisspot (for obvious reasons), the guzunder (because it ‘goes under’ the bed) and the ‘Jerry’. This latter name came from the appearance of the Kaiser’s head on the bottom of receptacles produced in Britain during World War I, replaced with that of Hitler during World War II. Apologies to Germans, but this is a piece of history that many people collect as specialty items. While collecting porcelain chamber pots, you might be interested in collecting some unusual versions, and those with lids are fairly common, though miniatures used for a child’s doll’s house can be fairly valuable. If you are very lucky, you might also come across enameled or gilded pots decorated with jewels. 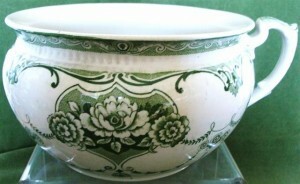 Another aspect of collecting porcelain chamber pots is the commode. The design of chamber pot is not very conducive to sitting on it, particularly those fashioned from delicate porcelain rather than the original clay earthenware. The solution to chamber pots breaking under the user’s weight, with consequently disastrous results, was specially designed chairs with holes cut in them to accommodate the chamber pots. These commodes would be lidded, and the chambermaid would check for use each morning. Not the best job in the world! There is a form of porcelain chamber pot known as the ‘Bourdaloue’, designed for women. Such pots are designed with an oval or long rectangular shape to accommodate the female anatomy. They are said to be named after a French priest of the same name, whose sermons were so long that women in the congregation would take their chamber pots with them to use under their skirts, but this is probably incorrect. The term ‘loue’ probably comes from the French L’eau for water, the same derivation for the term ‘Gardyloo’ used in Scotland, (Gardez L’eau – watch out for the water) when residents threw the contents of their chamber pots out of their tenement windows with a yell of ‘Gardyloo’!. This is also the derivation of ‘loo’, used in the UK for a W/C or washroom. Norman French had an influence in Britain for centuries, and still influences the language. It’s amazing how the original meaning of words and phrases becomes clear when one studies antiques! Collecting porcelain chamber pots will not only improve your vocabulary but will give you an insight into history and also offer you a great deal of pleasure in collecting items that were functional in the full sense of the word, but also very decorative.